If you owe a tax debt to the ATO, you should be concerned with three things. Firstly, is there anything that you can do to reduce the tax debt? You may be able to have your tax debt reduced if you can show the ATO that it would be fair and reasonable to remit your interest and penalties. Secondly, can you negotiate a payment arrangement with the ATO? Under a payment arrangement, you agree to pay the tax debt off over time and the ATO agrees not to take any steps to formally recover the tax debt. Thirdly, you need to know the steps that the ATO can take to collect your tax debt if you don’t enter into a payment arrangement or if you don’t stick to the agreement. I specialise in helping taxpayers deal with their tax debts. If you’re having issues with a tax debt, then call me on 1300 75 84 84 or get in touch with me here to arrange a consultation. No matter where you are in Australia, I can help you. Having a large tax debt can be stressful. It can be really helpful to know how your tax debt is made up, so you can find out if any of it can be reduced. A tax debt is usually made up of several components. The first component is the primary tax – which is the actual tax that you must pay. This can be made up of income tax, GST, fringe benefits tax, pay as you go withholding tax or another kind of tax that you owe. Then there’s the interest that accrues when the primary tax is not paid (the general interest charge, or the GIC). Your tax debt might also include penalties for not lodging either your income tax return or your business activity statements (BAS) on time. These are also known as failure to lodge, or FTL, penalties. There are also some less common kinds of interest and penalties that you may be charged. For example, the shortfall interest charge (the SIC), tax shortfall penalties and penalties for making a false or misleading statement to the ATO. These additional charges of interest and penalties can make an already large tax debt more difficult to manage. The ongoing accrual and compounding of interest can make it feel like you will never get on top of the debt. The ATO can reduce (remit) most kinds of interest and penalties, if you meet certain criteria. Sometimes these remissions happen automatically. For example, some smaller amounts of the GIC (usually amounts under $100) are often remitted automatically. If the remission is not automatic, then you will need to apply to the ATO to ask for a remission. In some cases, you can request the remission over the phone (e.g. for smaller amounts, or simple cases). If the GIC and penalties are for a larger amount, then it is usually better to lodge your application in writing. Your application should contain enough information and supporting documents to show that it is appropriate to grant you a remission. You should take care when preparing the application – if the ATO says ‘no’, then you don’t get a second go at it, unless you go to the Federal Court. The ATO will also consider your compliance history when deciding whether to remit interest and penalties. This means that you should do your best to have your lodgements up to date before making your application. You should also try to have all the primary tax paid before you apply for a remission, if possible. Of course, it is not always possible to pay all the primary tax in a short period of time. If you cannot afford to pay it, you should consider making a payment arrangement proposal at the same time as applying for the remission. 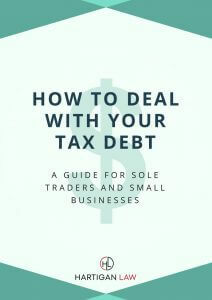 You can find out more about how to request a remission of interest and penalties by downloading my eBook, ‘How to deal with your tax debt – a guide for sole traders and small businesses’. What happens if the ATO refuses your application? If the ATO refuses your application for remission of the GIC, you cannot object to the decision in the same way you can with other tax decisions. Your only formal right to appeal is to the Federal Court (but not the AAT). This means that you should be careful when applying for a remission of the GIC. If your application is incomplete or doesn’t include the right kind of information, then the ATO may refuse it even if your circumstances would qualify you for the remission. There is no cheap or straightforward way to have a poorly constructed or incomplete application re-considered. It is a difficult and expensive process to appeal refused applications, because you can only do so in the Federal Court. If the ATO refuses your application for remission of a FTL penalty, your next step will depend on the amount of the FTL penalty. If the amount of the penalty that remains owing is more than two penalty units (as at 1 July 2016, two penalty units equals $360) then you can object to the decision. If the amount owing is less than two penalty units, you could, in theory, appeal the decision to the Federal Court. This would be a very expensive process to try to recover a small sum of money. Not all types of penalties can be remitted. The objection process is different from applying for a remission. You can read more about tax objections here. I have helped several clients apply for, and receive, remissions of large amounts of interest and penalties. I can help by working with you to determine the exact cause of your non-lodgement or non-payment. I can give you advice on whether you are likely to receive a remission. If you are, then I can put these reasons in writing to the ATO in a clear and convincing way, and show the ATO why a remission should be granted. Having a tax debt is stressful and I understand that it is tempting to simply ignore it. Unfortunately, adopting this ‘head in the sand’ approach is one of the worst things you can do. Interest will continue to accrue on the unpaid amount and the ATO won’t leave you alone. It is possible to negotiate a payment plan with the ATO. Sometimes this can be as simple as making a suggestion to the ATO that you will pay a certain amount per week or month, until your debt is paid off. If this is accepted, then the ATO will agree not to take any legal steps against you for the debt, as long as you comply with your arrangement. For a personal tax debt, the ATO will ask about your income, expenses, assets, liabilities, and other financial details. For a business tax debt, the ATO will look at the viability of your business by assessing information such as financial statements and details of the debtors and creditors. The kind of payment plan that the ATO will accept usually depends on where you are in the debt recovery cycle. The terms of the payment plan are usually more manageable if the ATO has not yet started formal recovery proceedings against you. This means that the sooner you negotiate with the ATO, the better. What happens when you’re in a payment plan? Sometimes a simple mistake can lead to the default of a carefully negotiated payment plan. There are steps that you can take to protect yourself from this – read more about these steps here. What about the general interest charge? The ATO has debt collection powers like no other creditor. The tax law gives the ATO many different ways to collect unpaid tax. This means it is important to work with the ATO to negotiate when and how you will pay your tax debt. I know it is tempting to simply ignore the problem, but this is not in your best interest. Ignoring the problem will not make it go away – it will make it worse. The ATO has the power to issue a garnishee notice as a way to collect unpaid tax debt. The ATO can issue a garnishee notice to someone who holds money for you, or who owes you money. The notice requires that person to pay ‘your money’ to the ATO, which is then applied towards your tax debt. For example, the ATO can issue a garnishee notice to your bank, your boss, your clients or even the buyer of an asset that you are selling. Garnishee notices are serious. A person who receives one must follow it. If the person does not pay the money to the ATO as required by the notice, they can be convicted of a criminal offence and ordered to pay a fine to the court. Unfortunately, I have seen situations where an ATO officer has not complied with this Practice Statement. This has resulted in the ATO issuing a garnishee notice when it shouldn’t have. In these cases, it is possible to have the garnishee notice withdrawn, but it takes some negotiation and argument with the ATO to make this happen. How does the ATO use a garnishee notice? From 1 July 2017, the ATO will be able to report your unpaid tax debt to credit reporting agencies, if your debt is over $10,000 and you have not engaged with the ATO about paying your debt. This black mark on your credit report can make it difficult to get a loan or trade credit in the future. If you are able to get a loan, you are likely to have to pay a higher interest rate than you otherwise would have. Read more about the ATO’s ability to report your unpaid debt here. When a company owes a tax debt, there are certain situations where the ATO can make the company’s directors personally liable for the tax debt. This happens by issuing a Director’s Penalty Notice (a DPN). The ATO can issue a DPN to a director of a company that has not paid its Pay as You Go Withholding (i.e. the tax component of employee wages) or Superannuation Guarantee Charge (i.e. the super component of employee wages). There are two types of director penalty notices – a Standard DPN or a Lockdown DPN. You can read more about them and the defences available here. It is possible for the ATO to stop you from leaving Australia until you have paid your tax debt or entered into an arrangement to pay it. However, the ATO does not issue these orders very often. You can read more about Departure Prohibition Orders here. If you are an individual who owes the ATO money, then the ATO can also use the bankruptcy process to collect unpaid tax. This usually only happens if the ATO has exhausted other options without success. The bankruptcy process usually starts with a summons or a claim. The exact process will depend on the laws in your State or Territory. A summons or claim starts a process in the court, where the ATO will ask the court to make an order that you must pay the tax debt. The tax law says that once the ATO has issued you with a notice to pay a tax debt (e.g. a notice of assessment), then you owe that tax debt. This makes it very hard to defend a summons or claim filed by the ATO, because the judge has to abide by the tax law. This means that even if you think that the ATO has calculated your tax incorrectly, the law allows the ATO to recover the full amount. The fact that the law is weighed so heavily in the ATO’s favour means that you need to be careful in your strategy for dealing with the unpaid debt (particularly if you don’t agree with how the ATO calculated the amount). Having said that, it is possible (though unlikely) that there could be a defect in the ATO’s summons or claim, which might allow you to have it withdrawn or file a defence. You should have a lawyer look over the document to see if there is anything wrong with it that means it is invalid. If you are served with a summons or claim, do not ignore it. First, you need to check that it is valid. If it is, then you need to recognise this as your chance to start communicating with the ATO about how you can pay your debt, before the ATO takes further steps towards bankrupting you. In my experience, the ATO doesn’t want to bankrupt people – it just wants to be paid. If the summons or claim is valid and you can’t work out a payment plan with ATO, then the ATO will get a default judgment against you. This is an order made by the court that you have to pay the tax debt. The ATO can execute that order in different ways. For example, the ATO can enforce the court order by obtaining a warrant to have your personal property seized. Most often, the ATO will execute the order by issuing you with a bankruptcy notice. It is possible to have a bankruptcy notice, or underlying court order set aside, but it can be difficult. The ATO has a lot of experience in issuing these documents. It doesn’t often make the kinds of mistakes that can result in the notice or court order being set aside. Applying for the notice or underlying court order to be set aside may buy you more time. However, unless you have strong grounds for your application, it is an expensive delay tactic and you may be better off focusing on negotiating a payment arrangement with the ATO. Assuming the bankruptcy notice is not set aside, and you don’t pay the debt or enter into a payment arrangement within the 21 days, the next step that the ATO will take will be to file a creditor’s petition. This petition asks the Federal Court to make a ‘sequestration order’ against you. This is the order that formally declares you bankrupt, and appoints a Trustee in Bankruptcy to your property. The court is entitled to presume that you are bankrupt if you did not comply with the bankruptcy notice. You will need to work very hard to prove otherwise. To do so can be very difficult and expensive – you will usually need to prove to the court the value of all your assets, all your liabilities, your income and your expenses. It is not just a matter of handing up a spreadsheet with this information. The court can require formal valuations and the involvement of a forensic accountant before it can be satisfied that you are not bankrupt. If you cannot convince the Court that you are not bankrupt, or reach an agreement with the ATO about the debt, then a sequestration order will be made and you will become bankrupt. Bankruptcy has serious consequences. For example, if you are in a trade that requires a licence, such as a building licence, then your bankruptcy can disqualify you from holding that licence. Do not ignore a summons or claim, or a bankruptcy notice. start communicating with the ATO about how you can pay your debt. It might mean that you need to sell some assets, borrow some money or apply for a remission of interest and penalties. It almost always means that you will need to provide the ATO with full details of your financial position and negotiate how you can pay the debt over time. The ATO can also apply to wind up a company that has unpaid tax debt. This process starts with a statutory demand (also known as a Form 509H), which requires the company to pay the tax debt or enter into a payment arrangement within 21 days. If the company does not comply with this demand, then the ATO can use the non-payment as evidence that the company is insolvent. This allows the ATO to apply to the Federal Court to wind up the company. If your company receives a statutory demand, or the ATO has applied to the Federal Court for a winding up order, you should contact the ATO to negotiate how the company can pay its tax debts. As with bankruptcy, it is difficult to convince the court not to make a winding up order. It is much better to negotiate with the ATO to put a payment plan in place and then have it withdraw its application. You can read more about ATO winding up actions here. I have helped many clients to negotiate with the ATO about their tax debt. I have had hundreds of thousands of dollars of interest remitted for clients, negotiated many payment plans, and helped to deal with the ATO when it has escalated its debts recovery action. I work with clients all over Australia and internationally. I can do this because the tax issues I deal with are Federal – if you’re dealing with the ATO, then I can help. I can be contacted on 1300 75 84 84 or at catriona@hartiganlaw.com.au. Click below to download your free 20-page eBook. You’ll learn how to reduce your tax debt and negotiate a payment plan with the ATO.